Naturally & artificially flavored. New look & taste! 2x vitamin D of an 8 fl oz glass of milk. As much calcium as a 6 oz cup of yogurt. 21 vitamins & minerals. 10 g protein. Per One Bottle Serving: 240 calories; 1 g sat fat (5% DV); 150 mg sodium (6% DV); 15 g sugars. Good nutrition from the start. Provides essential nutrients to start your day. Excellent Source of: protein to help build muscle; calcium & vitamin D to help builds strong bones; 21 vitamins & minerals in each ready-to-drink bottle. Provides Choline: Contains 55 mg choline per serving, which is 10% of the Daily Value (DV) for choline (550 mg). 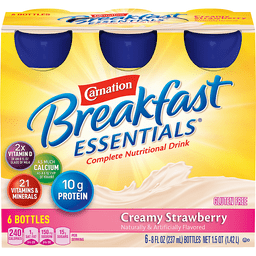 Carnation Creamy Strawberry Breakfast Essentials® Complete Nutritional Drink. New flavor! 6 bottles. 2x vitamin D of an 8 fl oz glass of milk. As much calcium as a 6 oz cup of yogurt. 21 vitamins & minerals. 10g protein. Creamy strawberry. Naturally & artificially flavored. Calories 240, Sat fat 1g 5% DV, Sodium 150mg 6% DV, Sugars15g per one bottle serving. 6-8 fl oz (237 ml) bottles. Good nutrition from the start™. Can't find your favorite flavor Go to buycbe.com to order products online! Please recycle this overwrap The nutrition of a balanced breakfast. It's good to know. Nestle health science. Provides essential nutrients to start your day. Excellent source of: Protein to help build muscle. Calcium & vitamin D to help build strong bones. 21 vitamins & minerals. In each ready-to-drink bottle. Nutritional Compass®. Carnation, Breakfast Essentials, complete nutritional drink, 10 servings, rich milk chocolate. Questions/comments 1-800-289-7313 Monday - Friday 8AM-8PM ET. For product information and recipe ideas visit carnationbreakfastessentials.com. All trademarks are owned by Societe des Produits Nestle S.A., Vevey, Switzerland. © 2013 Nestle.